What Do Long Drive Champions And Rockers Have In Common? Arnold Palmer Golf Academy's Director of Instruction adopts Tempo in Motion, a proven sports performance system. Coach of Masters Champion, Pat O'Brien, Joins the Tempo In Motion Team. 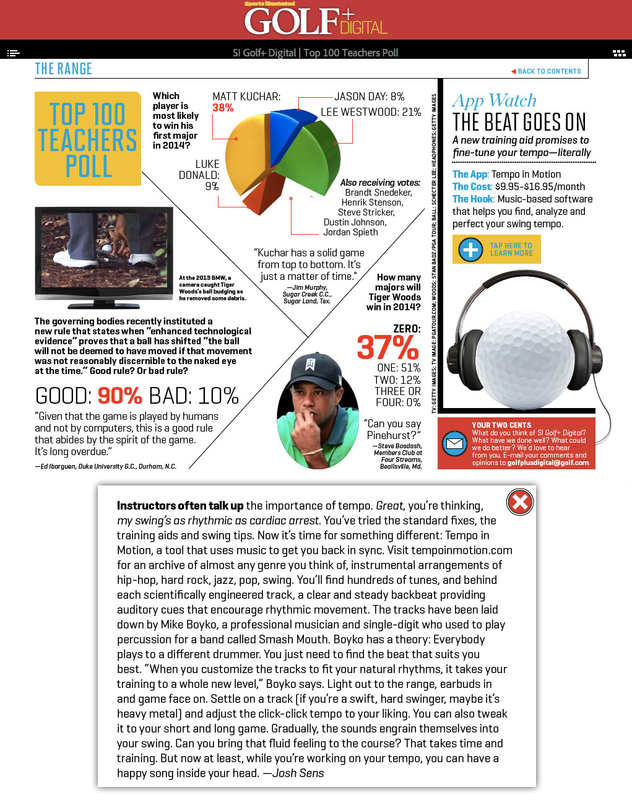 Tempo in Motion Launches First Tempo Radio that Improves Golf Performance. The media should contact Kenni to request a preview account. "Tempo in Motion is the best means to find the sync in your swing. You'll be amazed at how solid and straight you can start hitting it." "The overall goal when you putt or play golf is to have a flow or rhythm about you. That's why I love Tempo in Motion!" "I start with a correct diagnosis of the student's mistakes, and explain my plan to them. Then, after working with them on correcting those mistakes, Tempo in Motion is the glue that holds their improved swing together." "I was amazed at the difference Tempo in Motion made with my golf swing. I was relaxed and felt the rhythm in my body. It gave my swing an entirely different character." "Tempo in Motion is fun and easy to use. It's one of the most innovative ideas in golf teaching and I am a 100% behind it!" Mike has a lifelong passion for rhythm, music and sports. A professional drummer for the last 20 years, Mike has performed around the world with A-list groups of the music industry. Some highlights include drumming for heavy metal band Ludichrist/Scatterbrain and UK pop-rock band FAT, which toured with Smashmouth, Third Eye Blind and Sugar Ray. Most recently Mike played with hip-hop rock band 2 Skinnee J's, which opened for Outkast, Ludacris, Jurassic 5, Incubus and 311. Also an avid and competitive athlete in golf, ice hockey and a myriad of other sports, Mike couldn't help but translate his percussion background and knowledge of rhythm to athletic performance. With the consultation of golf professionals across the country, Mike applied his idea of utilizing beats and music to practice proper swing tempo. He composed and recorded the proprietary music tracks that comprise the Tempo in Motion system and then opened up Tempo in Motion as a platform for signed and unsigned musicians to share their music with a broader audience. As a partner in a law firm, Alina practiced law as a business litigator in Switzerland for more than 10 years. She was counsel to many public and private institutions, including international corporations. She left Lake Geneva to travel around the world before settling in the U.S. At Tempo, Alina supervises all operations, from legal matters to marketing. Kenni Driver, a sports enthusiast and avid tennis player, has 27 years of senior level experience in marketing and public relations for start-up technology companies. She has successfully launched more than 35 companies, products and sites. Ms. Driver is responsible for thousands of articles, dozens of spots and cover stories and hundreds of awards.She has spoken at numerous events and won international awards for her writing. Ms. Driver has presided on several boards, including serving as president of the Dallas Tennis Association. Tempo in Motion is the result of a long chain of events. Here are highlights of what shaped our company. 1990 Scatterbrain/Ludichrist, with Mike Boyko on drums, rocks its way to a Gold Record in Australia. 1992 Fred Couples "the smoothest tempo in golf" wins the Masters. 1993 Carmine Appice's Power Rock Productions releases best-selling instructional video "Beating the Traps" by Mike Boyko on intricate rhythms and techniques. 1997 Mike Boyko applies his on-stage "beat loops training" to his inconsistent golf game. 2001 The digital music industry salutes Apple's first iPod. 2004 Mike starts developing his tempo and rhythm system and gathers feedback from golf pros. 2008 The first Tempo in Motion website is launched, offering Tempo Tunes for full swing only. 2010 Tempo in Motion hires the Santa Fe Complex to develop its "tempo" software for golf coaches. 2011 A new website is launched, with advanced tempo testing software for all golf shots and Tempo Tunes by artists worldwide. 2012 Tempo in Motion introduces Tempo Tunes Radio, the first streaming radio for sports tempo and rhythm training. 2013 A new easy to use Tempo in Motion mobile site allows golfers to train anytime anywhere.